For Peat’s Sake: Doug Johnstone’s ‘Smokeheads’… | Scots Whay Hae! Third novels, like third albums, are notoriously difficult. It’s usually the point when a writer either runs out of ideas or they really discover their voice and move forward. 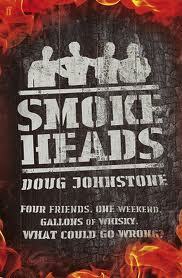 Doug Johnstone’s third novel Smokeheads moves forward with such momentum that it fair takes your breath away. I enjoyed his debut Tombstoning and the follow up The Ossians, but Smokeheads is a step up from those. As always the story rattles along. Few writers take you through a book at the pace Johnstone does. You are just coming to terms with what you’ve read when the next twist in the tale comes and quickly goes. Smokeheads is about four friends whose bonds were formed by university and a shared love of single malt. The title refers to whisky lovers who prefer smokier and peatier flavours in their glasses such as those distilled in the southern part of Islay, the place where the action takes place. Johnstone’s own passion for whisky is palpable and I can imagine a few people’s drinking habits changing after they’ve finished reading. The gang of four, Adam, Roddy, Luke and Ethan, have continued to meet up over the years despite appearing to now have little in common apart from shared history and hangovers. They undertake a road trip to visit the best distilleries and batter some expensive and rare malts. What starts out as a boozy do soon descends into a terrifying tale involving police and thieves who happen to be one and the same. Along the way they add local distillery guide Molly to their motley crew, and she initially holds out hope that at least one of the four’s life is about to improve. But Johnstone isn’t going to allow sentiment, and he pulls the rug out from under everyone’s feet, reader included, with indecent haste. It’s perhaps unsurprising that I enjoy Doug Johnstone’s writing. So far he has written about whisky, indie music and jumping off cliffs; three of my favourite things. With Smokeheads he has written the very definition of a page turner. I read it in two sittings, with only sleep getting in the way. Scotland has lots of great thriller writers such as Christopher Brookmyre, Louise Welsh and the Ia(i)ns Rankin and Banks. In terms of sheer enjoyment this is the company that Johnstone is heading towards, and with Smokeheads he is knocking loudly on their door. Any novel that makes me go out and buy a bottle of Laphroig quarter cask is all the recommendation you should need. Slange. Pingback: Echo Beach: The Scots Whay Hae! Podcast’s Annual Trip To Talk To Doug Johnstone By The Sea… | Scots Whay Hae!